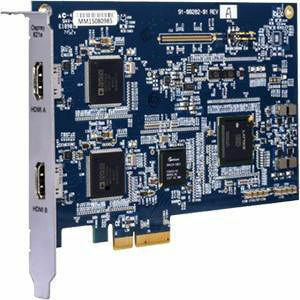 The Digital HDMI PCIe Series of Capture Cards offer a wide range of input selections, including single and dual HDMI, as well as Multi-Function Input cards. SimulStream® a standard feature on all HDMI models, is an Osprey feature which allows each input to produce multiple parallel output streams with completely independent settings for color space, cropping, scaling, closed caption and overlays facilitating simultaneous delivery to multiple applications. The quality, reliability and flexibility makes this series perfect for applications in Broadcast, Education, Enterprise, Government, Medical, Military, Sports and House of Worship.